This year for World AIDS Day, the Elton John AIDS Foundation (EJAF) has partnered with Kwippit, the new mobile messaging app, to raise awareness about the global AIDS epidemic and dollars for the Foundation’s lifesaving work. 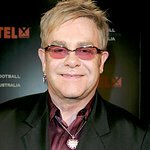 Elton John and many EJAF celebrity friends who have long supported the Foundation’s work have created unique heart designs for a campaign, launched through Kwippit on World AIDS Day, December 1, and continuing throughout the month. Every day for the month of December, one new celebrity-designed heart will be released by Kwippit to users who have subscribed to the special Elton John AIDS Foundation channel on the Kwippit mobile app for an annual fee of $0.99. Not only will subscribers have access to these custom celebrity designs, but Kwippit provides an opportunity for them to engage with the content, personalizing the hearts with text before sharing them with friends, family, and followers via social media, while simultaneously raising vital funds for AIDS prevention and research. Celebrity participants include Elton John (who contributed six designs that will be released throughout the campaign), Boy George, Andy Cohen, Chris Colfer, Ellen DeGeneres, Beth Ditto, Ansel Elgort, Jonathan Groff, Neil Patrick Harris, Colton Haynes, Cheyenne Jackson, Billie Jean King, Heidi Klum, Padma Lakshmi, Adam Lambert, Cyndi Lauper, Sandra Lee, Lea Michele, Matthew Morrison, Ozzy Osbourne, Andrew Rannells, Andy Roddick, Jake Shears, Sharon Stone, Russell Tovey, and Steven Tyler. “I am so grateful to all of the EJAF friends participating in this Kwippit project for sharing their creativity with us, supporting our work, remaining steadfast to the cause, and believing in our ideals,” said EJAF Founder Sir Elton John. One hundred percent of the proceeds from channel downloads will go to EJAF’s grant-making programs, working to ensure everyone has the information and means to prevent infection and all people living with HIV have access to high-quality medical care and treatment. To maximize the impact of this digital campaign, all 31 original heart designs (6"x 6" heart-shaped tiles signed by each celebrity partner) will be framed and auctioned during the Foundation’s 26th annual Academy Awards Viewing Party on Sunday, March 4, 2018, to benefit EJAF’s work. To participate in this special digital art campaign and support the effort to end AIDS, please download the Elton John AIDS Foundation channel on the Kwippit mobile app.